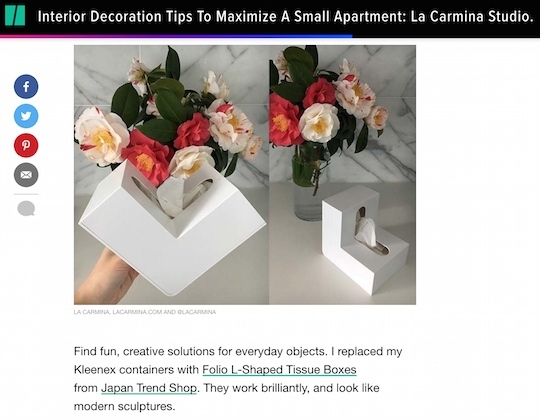 Fashion blogger and influencer La Carmina wrote about our Folio L-Shaped Tissue Box on her personal website and then on the Huffington Post for a roundup of "interior decoration tips to maximize a small apartment." Here's what she had to say: "Find fun, creative solutions for everyday objects. I replaced my Kleenex containers with Folio L-Shaped Tissue Boxes from Japan Trend Shop. They work brilliantly, and look like modern sculptures."